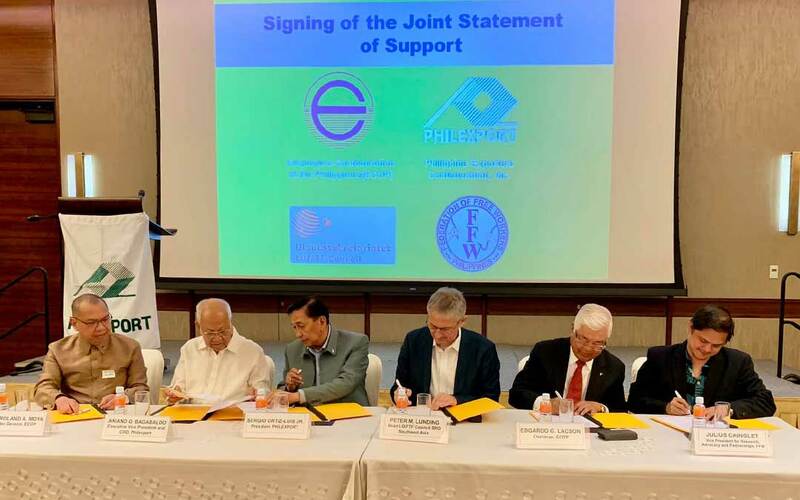 The Employers Confederation of the Philippines (ECOP) and the Philippine Exporters Confederation, Inc. (Philexport) signed a Principle-based, Inclusive and Business Sustainable Corporate Social Responsibility (PBIBS-CSR) Joint Statement of Support. This was done on March 19 during Philexport’s 1st Quarter General Membership Meeting at Solaire Resort & Casino, Paranaque City. The Joint Statement was signed by ECOP Chairman Edgardo G. Lacson and Philexport President Sergio Ortiz-Luis, Jr. and witnessed by ECOP Director General Jose Roland Moya, Philexport Executive Vice President and COO Aniano G. Bagabaldo, Federation of Free Workers (FFW) President Jose Sonny G. Matula and Peter Lunding, Head of Danish Trade Union Council for International Development Cooperation (LO/FTF Council), SRO Southeast Asia. Through the Joint Statement, ECOP and Philexport vowed to work jointly with LO/FTF and FFW through a new initiative on CSR called PBIBS-CSR project. This aims to increase awareness among labor market actors (State, employers and trade unions) on the benefits of sound CSR policies and strategies on a national and sectoral level. It also seeks to produce a principle-based and business sustainable model on CSR. In addition, ECOP and Philexport will raise awareness about the “principle-based” approach to CSR and promote cooperation between employers groups and other stakeholders in the field of CSR in identifying and implementing a joint CSR strategy in line with international CSR instruments based on the UN Global Compact, UN Guiding Principles on Business and Human Rights, ILO MNE Declaration and OECD Guidelines.